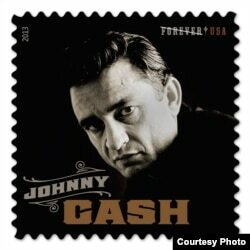 WASHINGTON — Earlier this year, the U.S. postal service revealed plans for a new stamp set called Music Icons. The series shines the spotlight on three American originals. The first issue in the Music Icon series honored Lydia Mendoza, a pioneer of Tejano music, the style that comes from the Texas-Mexico border area. The art for her stamp uses an old publicity photo of a smiling Mendoza holding her 12-string guitar. The Texas state flag is superimposed over the singer and the stamp looks much like an old, worn, record cover. Actor Jesse Borrego, a San Antonio native, was the master of ceremonies at the Lydia Mendoza stamp unveiling. He says the new stamp helps to cement the legacy that Latinos have had in the United States. Kathy Cash, one of Johnny Cash’s daughters from his first marriage, spoke at the ceremony. She told the crowd that during her parents’ courtship, her father was serving in the U.S. Air Force and was stationed in Germany. She estimated that her parents exchanged more than 10,000 letters during those years. John Carter Cash says that letter-writing tradition continued for the rest of his father’s life. And while the younger Cash often relies on email, it’s not likely he’ll step up to the post office counter and buy anything but a Johnny Cash stamp. This isn’t the first time the U.S. Postal Service has issued music stamps. The Legends of American Music series began in 1993 with an Elvis stamp and went on to honor Broadway and film composers, jazz and blues artists, big bands, opera singers and more. 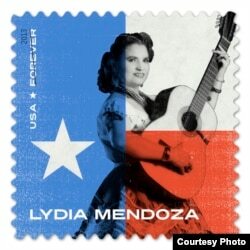 There have also been stamps honoring Latin music legends, gospel singers and folk musicians. And there is one more to come in the Music Icon series this year. A Ray Charles stamp will be released in September.